From your computer's [Start] menu, select [All Programs] - [Pro-face] - [GP-Pro EX *. *] (*. * indicates version), and click [Project Converter]. 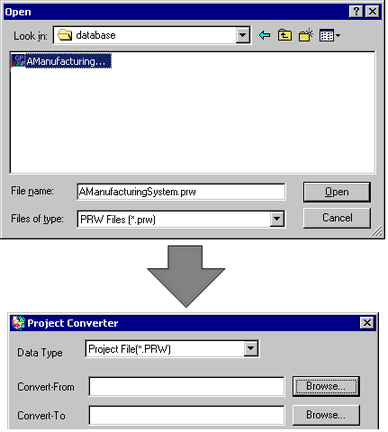 The Project Converter window opens and the [Project Converter] dialog box appears. For [Convert From]type, select [Project File(*.PRW)]. To convert [Pro-Control Editor] files, select [Logic File(*.wll)]. To convert partial program files (*.wlp) or subroutine program files (*.wlf), you need to use GP-PRO/PBIII to save the files in Project File format (*.prw), then open them in the Project Converter. To convert a project (*.lte) from the LT editor, in GP-PRO/PBIII save it as a *.prw file to enable conversion. To convert GP-Pro/PBIII library files and mark library files, select either [Library File(*.cpw)] or [Mark Library File(*.mrk)]. In the [Convert From] field, select a GP-PRO/PBIII for Windows project file (*.prw). [Browse] Click to select the project file (Ex. "AManufacturing System.prw"), then click [Open (O)] to view the file in the [Convert From] field. [Convert To File]. Select a GP-Pro EX project file (*.prx). [Browse] Click the button, enter a new [File Name] (Ex. "AManufacturingSystem.prw"), and click [Save]. A new project file is selected in [Convert-To]. If a [Convert-To] file already exists, you are prompted to keep or overwrite this file. When converting a GP-PRO/PBIII mark library file (*.mrk), specify the GP-Pro EX mark library file (*.mak) in the [Convert-To] folder. Click [Convert] to start conversion. An error message may appear during project conversion. Depending on your display unit, the [Convert-To Model Type] dialog box may appear where you can select the model. When converting the library file (*.cpw), the [Select PLC type] dialog box appears. Select a valid device or PLC. When the following dialog box appears, set the CF Card folder. Changing the Destination in GP-PRO/PBIII for Windows "CF Card Data Output Folder"
After conversion, the [Save As] dialog box appears. [File name]. 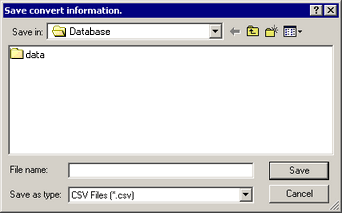 Define the file name and click [Save] to save the converted content to a CSV file. [Cancel] option returns to the [Project Converter] dialog box without saving the conversion information in a CSV file. In the [Project Converter] dialog box, click [Close] to exit. To use the converted library file in a project file (*.prx), you need to register it as a package. 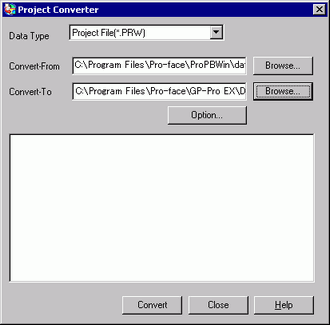 The Project File (*.prx) is created using the Project Converter version. A warning message may appear when you open project data whose version does not match the GP-Pro EX version you are using. As long as the GP-Pro EX version is later, you can edit without any issues. Select [OK] and edit. You can check the version of the Project Converter by right-clicking the title bar and selecting [Project Converter Version Information]. 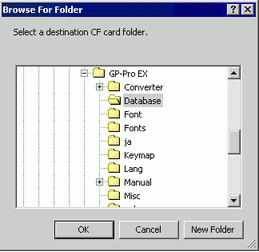 Converting the Destination in the GP-PRO/PBIII for Windows "CF Card Data Output Folder"
When converting a project file (*.prw) with a CF Card Data Output Folder, in Convert-To you are prompted to define the CF Card Data Output Folder. Select the appropriate folder (for example, "Database") and click [OK]. [New Folder (N)] creates a reference folder in the selected location. You always need to select [Yes] to convert the CF Card Data Output Folder in the [Question] dialog box. If you select [No], called images may not be properly displayed.